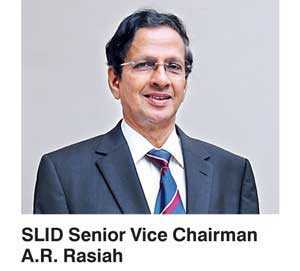 In a recent interview with Sri Lanka Institute of Directors (SLID) Senior Vice Chairman A.R. Rasiah, he shared his simple version of Corporate Governance which is ‘doing the correct thing in the right way’. To do the right thing is important, but doing the thing right is as important. Recently a test cricket Captain apologised for his mistake which was the correct thing and he went live on Television to say so facing millions of viewers – which was the right way. Corporate Governance is a buzz concept today in corporate circles but few truly understand what it actually means and stands for. Some even think this is a concept that cannot be put into practice and that it is something beyond them and their companies. Multinationals, large listed companies and banks, both in Sri Lanka and elsewhere follow this simple concept that we refer to as Corporate Governance and hence their success. It needs to be noted that due to lapses of some companies including fraud as well as due to their other shortcomings, various laws, rules and regulations have been enacted by various bodies to counter these lapses. Such laws and rules and regulations are to be seen in Company Law, Rules of the Stock Exchange, Regulations of the Institute of Chartered Accountants pertaining to procedures and disclosures, Exchange Control Regulations, to name but a few. Rules that have come into compulsion such as properly constituted board of directors with specific number of independent directors, audit committee, remuneration committee, and nomination committee; specialists with full knowledge of these laws and rules and regulations as they pertain to the different subject areas as listed above are around. Companies seek the assistance of these specialists as and when necessary. Some Companies employ these specialists full time to assist them. Open competition and merit-based recruitment as opposed to the cavalier approach of ‘jobs for the boys’, and even proper board level appointments as opposed to recruitment of ‘Golf buddies’ or ‘old school tie’ are some areas covered under Nomination committee. Merit based promotions or increments are covered by Remuneration committee. Adherence to approved best procedures and practices, distancing companies and staff members from kickbacks and commissions, are covered by audit committee. Public quoted companies have these committees in operation as they are required by statute but most of the other companies also follow these good practices for their success without knowing that they are required by statute for public quoted companies, added Rasiah. “Even in companies that are owned by one person (sole proprietorship), adherence to corporate governance is a step in the right direction. At the beginning perhaps when the company is small, the proprietor may be able to do precisely as he/she wants keeping an “eye on checks and balances” because he/she is in total control of the organisation. But, as the business grows and branches out, he/she will simply not be able to know all that happens within the organisation. It is here that corporate governance in whatever form comes into play as the business needs to be run with help from a team of leaders rather than by a single person however brilliant he/she may be. Attributes and procedures of corporate governance will make the business grow and prosper when it conforms to the requirements of corporate governance. If not, it will only be a matter of time before the business becomes unwieldy, run out of control and fail,” he added. “SLID has not confined its activities in the sphere of corporate governance to Colombo alone. We have carried the message to the outstations as well and, I am happy to say, it has been well received,” Rasiah observed. SLID works closely with Mercantile Chambers in the outstation areas we visit. In addition, SLID has initiated a Business Leadership Program which focuses on the training of company directors with a view to achieving ‘continuous improvement’. Given the demand for this program, SLID has now branched off to providing tailor made programs to suit individual organisations as one size may not fit all. While the participation in these various programs initiated by SLID is a happy sign, I need to emphasise the fact that it is in the implementation of these attributes of good corporate governance out of conviction by participants in the programs that is key, Rasiah said. Rasiah noted further that several companies though they strongly believe in and subscribe to good governance and the changing environment in which such governance is located today, find it difficult to shed some ’old habits’ that run counter to today’s realities. Although such a state of mind is understandable it is not something than can be condoned or excused. “Individuals in the boards of some companies accept the need for change in conformity with today’s laws, rules and regulations in private, but they are reluctant to go public with their convictions out of fear of consequences and likely reprisals. It is precisely in this context that the role of an independent director becomes important. But they, too, are subject to similar reprisals as the others. Recent changes introduced by the SEC envisage greater responsibility for independent directors,” he concluded.